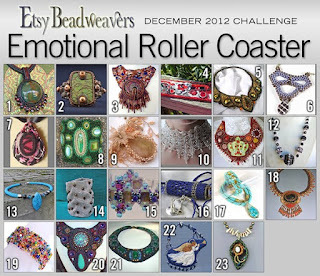 "Find beady inspiration in a human emotion. Choose a feeling or state of being: joy, sorrow, cowardice, jealousy, anxiety, or anything that describes a powerful emotion. 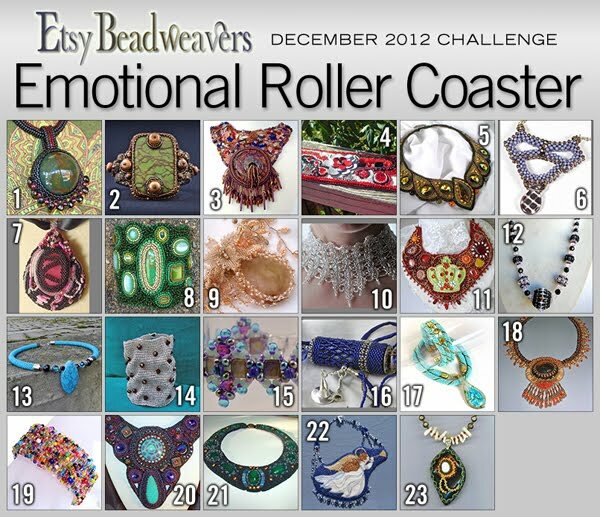 Create a beaded artwork that expresses your chosen emotion. Think about the use of design elements as you work. Colors all have emotional connotations, and lines and textures do, too. You can use repetition, gradation, mass, scale and proportion, pattern, contrasts, balance or harmony, anything you can think of to make your work look and feel like your chosen emotion. Try to avoid using symbols, like a smiley face or emoticons. The finished mosaic collection of our work will provide an "emotional roller coaster ride," a fast paced, whirlwind tour of feeling and sensation for our fans, as they view our many different interpretations of this theme. Remember to explain how you designed your work to demonstrate your chosen emotion in your description."